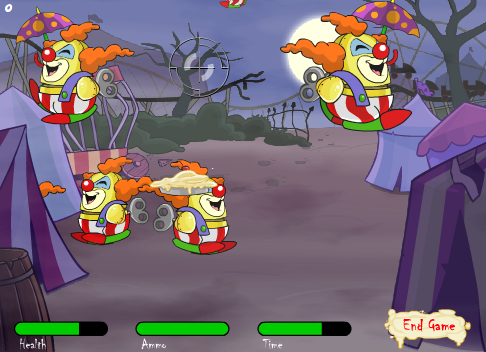 The nefarious Dr. Sloth has unleashed his horde of Chia Clown robots on The Deserted Fairground to ruin everyone's fun! Hone your shooting skills to beat back the invasion for an avatar or a trophy, but watch out for pies! Carnival of Terror is a gallery shooting game similar to the Haunted Shootery or the Cork Gun Gallery. The cross hair corresponds to your mouse cursor; left click to fire your weapon. For the duration of the game, Dr. Sloth's mechanical minions will parachute down from the sky and march across the screen occasionally slinging pies at you. Shoot as many as you can in the allotted time limit, but watch your ammo and health meters! If either of them run out, it's game over. During gameplay, bonus items will parachute down from the sky. While these are not worth any points, they will help keep your meters filled and prolong game time! Clock bonuses are essential to getting an avatar or trophy score, so make sure to shoot as many as you can! Clock Adds ten extra seconds to the timer. Ammo Adds ten extra shots to the ammo meter. 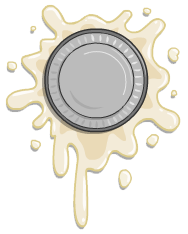 Health Adds one pie's worth of damage back to the health meter. 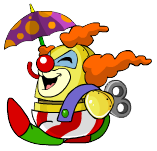 To eliminate those pesky robotic Clown Chias you'll need to focus on their weakest point: the cores inside their bodies. The body of each robot is surrounded by three different destructible pieces with different point values. While removing the external pieces will help expose the core, it can also be taken out with one well-aimed shot! Head 2 Points Shooting the head will help expose the body. Legs 2 Points The robot will still move without its legs, albeit slowly. This makes it an easier target. Arms 3 Points The arms can be difficult to shoot due to their smaller size, only aim for these if you are an accurate shot. Body 6 Points If you shoot both the arms and legs off of a robot, the body will self-destruct and hurt you after a few seconds. Make sure to destroy it before it does! A small part of the core is always exposed between the head and the legs. Shooting the wind-up key will also count as a body shot. Umbrella 1 Point Some robots will float down from the sky with an umbrella; shooting it will make them fall faster and more difficult to hit. Pie 1 Point Occasionally the robots will lob pies towards your screen, and they hurt! Try to shoot them down before they hit you. To achieve the 725 points required for the avatar, luck is a large factor. The rate at which the robots appear on the screen and the rate that bonuses drop are both completely random. In most cases you will run out of time before you run out of ammo or health, but there are a few things you can try that will help your chances of success. When the game begins, shoot the other parts of the robot before you shoot the body to accumulate as many points as you can. When you are low on ammo, type piecrust to completely refill your ammo bar. At this point you should switch to only shooting the small exposed part of the body between the head and leg pieces. Be careful when your ammo reserves begin to dwindle again; you always want to have a few shots left to pick up more ammo bonuses. If you have a lot of health to spare, forgo shooting the pies to save ammo as well. If your health becomes dangerously low, type custard to refill your health meter. Side Note: There is a widespread rumor that viewing the instructions for the game and clicking the picture of the clock will make bonuses (specifically clock bonuses) appear more frequently. After rigorous testing we have not found solid evidence to support this, but you are always welcome to try it yourself! Use the cheat code piecrust to refill your ammo meter. Use the cheat code custard to refill your health meter. Playing on the largest screen size will help your aim, especially for targets that are farther away. Shooting the exposed core of the robots between the head and the legs gives the most points for the least amount of ammo. If you only have a few shots left, save them for an ammo bonus. If you have a lot of health, you can forgo shooting pies to save ammo, but they will momentarily blind you. Having difficulty lining up your shots? If you blast the arms first, your cursor should be in line to shoot the midsection/wind-up key right after. This will save you both ammo and time.